There’s no doubt that the DIY (Do-It-Yourself) and Homemade Products fads have taken off in the last 10 years with the increasingly influential use of social media, particularly the Pinterest platform. STEP 1: Go through your comic book collection (don’t use the rare or expensive ones!) and look for superhero faces, action scenes, speech bubbles, and sound effect words like “Pow!” to cut out. STEP 2: For each cut-out, place an acrylic shape over the desired portion and trace around it. Keep each cut-out and acrylic shape together so that you know which one goes with which. STEP 3: Remember to cut inside the tracing lines a bit so that they fit neatly on the back of the acrylic shape. 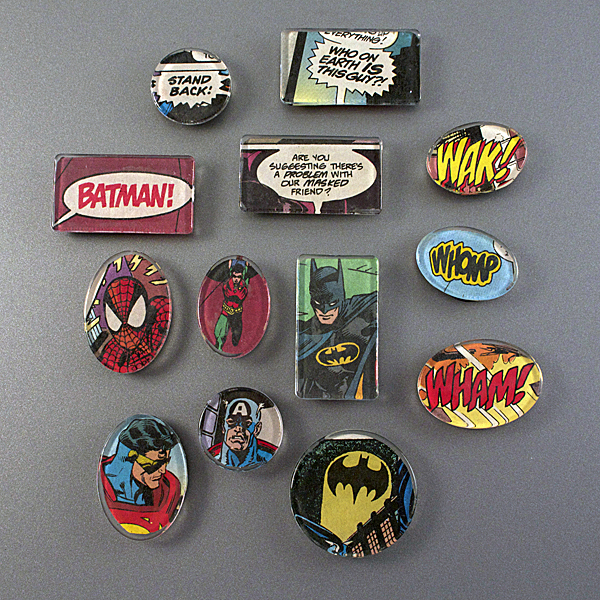 STEP 4: Now apply a thin layer of Mod Podge to the FRONT of each comic book cut-out. Then, press it to the BACK of the acrylic shape. If you mess up and need to reposition it, do it right away before it begins to dry (it’ll dry pretty quickly). To avoid air bubbles, be sure to press firmly. 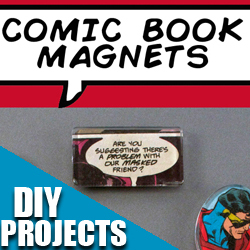 STEP 5: Add a little Mod Podge to a magnet and press it firmly onto the back of the acrylic shape. Do this for every magnet. Let them dry completely before enjoying. Mag-neato huh? STEP 1: Spray paint a terracotta pot and saucer in the color of your choice. Apply 2 coats to be safe and allow the paint to dry overnight. STEP 2: Cut out characters, villains, sayings, and action words from old used comic books. 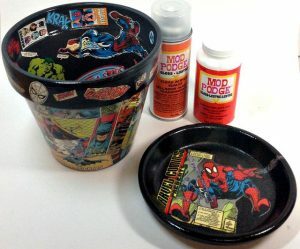 STEP 3: Use Mod Podge to stick comics to pot. Allow 15-20 minutes before adding an additional coat of Mod Podge on top. Repeat this process for 2 more top coats. STEP 4: Create a collage using the cut-outs. Experiment to see which fits best before gluing anything down. Don’t be afraid to cut or angle the cut-outs to get the perfect fit. STEP 5: Add 2 coats of Acrylic Sealer. This will give your DIY project a lovely glass-like sheen. You now have a comic book themed planter…just don’t put poison ivy in it!